Transportation Costs > How Much Does a Fire Truck Cost? How Much Does a Fire Truck Cost? Anyone and everyone who has ever seen a fire truck zooming down the road and heading for a neighborhood or house to put out a fire are, more often than not, impressed by the sheer size of that big, red emergency vehicle. Of course, since it is obviously not an ordinary vehicle, although it comes closest in appearance and size to a tanker, the question that is on the minds of everyone is how much does a fire truck cost? The cost of a brand new fire truck will greatly depend on the type of fire truck as there are a few different kinds of the market. A simple bush fire truck can cost $90,000 to $150,000, whereas a platform aerial truck with an outfitted engine and all of the necessary equipment can cost close to $1+ million. Most fire departments, from what we researched, will pay a finalized price of $600,000 to $950,000, again, depending on its outfitting and the type. As each department will have its own specifications depending on the local environment and demands, the costs can greatly vary. A fire chief and a couple of firefighters answered this very question on this Quora.com thread. The initial respondent stated that most fire trucks will cost under $1 million, while the other respondents agreed with this figure, stating that the basic fire truck (unequipped) can cost anywhere between $300,000 and $500,000. However, this price will increase as you include all the equipment that comes with the fire truck. On the DoverFire.org FAQ, the fire chief notes the replacement cost of a pumper engine comparable to their equipment would be close to $550,000. However, this wouldn’t include the $100,000 to $150,000 fee in order to outfit the engine As for a platform aerial ladder truck, the comparable prices to one they own would be roughly $930,000. Lastly, a tiller fire truck, which can steer in the rear as well, can cost a comparable $840,000. These two factors, just like the first estimate, will not include the equipment in order to outfit the truck itself. The Morning Call talked with a fire department that found out it would cost $3 million to replace its fire engines. The high costs, according to the manufacturers, is due to the ever-evolving technology and safety standards. In a similar article on North Iowa Today, the department was quoted $1 million for a new truck. Command Support Unit – An advanced technological truck which helps with a larger scale-based accident. This type of truck can help with many types of scenarios when at the scene. Conventional – Referred to as a fire engine, water ladder, pumper or pump ladder, the conventional fire truck may have several methods in order to pump water onto the fire. The most common method, as per d4htechnologies.com is via a pump through the hose to the fire. Foam Tender – These types of trucks carry a large amount of foam and will be used where water won’t be effective. These trucks can take foam as either a tanker or as a truck carrying foam packets or barrels. HAZMAT – A HAZMAT fire truck is often found in a larger metropolitan area. These trucks are designed to clean spilled oil, to full decontamination units or clean victims and/or rescuers after a contamination incident. Heavy Rescue Vehicle – Commonly referred to as a Rescue Company, this type of specialty truck is basically a toolbox on wheels. These trucks can help extract vehicles during a traffic collision, help with rope rescues, enter confined spaces and/or assist during a building collapse, for example. Hydraulic Platform – Also known as an articulating boom or platform truck, these trucks are considered to be an aerial work platform designed to provide high-level access and/or an elevated water pump position. Tanker Truck – A tanker trucks purpose is by transporting large amounts of water to a scene where fire hydrants or water resources or unavailable or insufficient. Tower Ladder – In most cases, a basket will be mounted at the top of the fire truck’s ladder, allowing a firefighter to fight a fire from a secure place. Turntable – This is probably the best-known type of fire truck, which has the purpose of gaining access to a fire at a certain height while using a larger telescopic-like ladder. Other equipment such as hoses, EMS supplies, and hydraulics will often cost and additional $400,000 to $500,000. 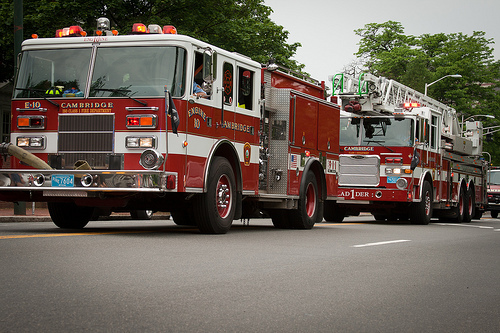 The most common types of fire trucks often purchased from a local fire department will include a pumper/engine truck, a wildland truck of some sort or a ladder truck. The typical firetruck can hold 400 to 500 gallons of water.